Nebtree is an internet management system that enables you to deliver reliable, controlled and stable internet access through user management for hotels, conferences, malls, restaurant, resorts, hospitals and other public places. This hotspot Bandwidth management system complies with government norms for delivering internet access to users with SMS based verification or by integrating with user registration system. Founded in the year 2005, Nebero Systems has become one of the industry leading software product development companies in India. The company is a premier service provider of enterprise network gateway security systems that operate with open source technologies offering reliable, secure and world class product and solutions. Headquartered in India, with partners all across the globe Nebero has so far reached and catered to diverse client requirements in India, US, UK, Europe, Africa, South Asia and the Middle East. Apart from offering its well-crafted software solutions, the company offers unlimited user license guarantee. Control bandwidth usage & its abuse by restricting users with limited Internet speed & bandwidth quota on daily basis and pre-set expiry date for users. Bandwidth management control allows stable, effective and optimal usage of Internet Line. For meeting, conferences and guests, Internet access can be enabled by authenticating & registering new users via SMS, Printed Coupon, thus complying with TRAI (Govt. Set Norms). Nebtree Dashboard provides visual and intuitive Live view of Internet bandwidth usage via Internet Service Providers, Users using Internet, System Health, Load and many more. Also Visual alerts are available for new user registration, Internet outage on a link. Create your custom Internet plans that best suits to your available bandwidth limits. Now enjoy the flexibility to use your bandwidth just the way you want to. And even can name your pack and share it for enjoying a seamless and uninterrupted service. To compliment your brand, we designed a responsive User Experience that each of your guests will see when connecting to the service. Customise the login page, landing page with offering deals,advertisements, special discounts and many more services. Monitoring system data helps you to keep your environment running smoothly, provides the means to correct problems before outages occur & thus reduces the costs. Providing real-time view of Internet bandwidth you can modify bandwidth settings of users while in use. Our solution you can integrate with property management system which allows you to create Internet accounts directly from PMS software at the time of Check-In. Internet users will get locked/archived as part of check-out process. APIs helps to save time and increase organizational efficiency. Content filtering system prevent certain categories of web content being available and also help protect users from malicious sites. This filter can be applied at DNS Level. You can make different rules for your WiFi with one Public network and one Private network. Multiple Internet connections for ensuring 100% Internet up-time for your guests. It includes data loads can be shared between multiple Internet connections to give privileged services to elite guests. It has ability to connect with three Internet connections simultaneously to protect from fail-over. PProviding contemporary dashboard, Internet usage tasks & each network user reporting gives access to comprehensive information quickly. Any kind of report can be analysed & results used to drive appropriate actions. 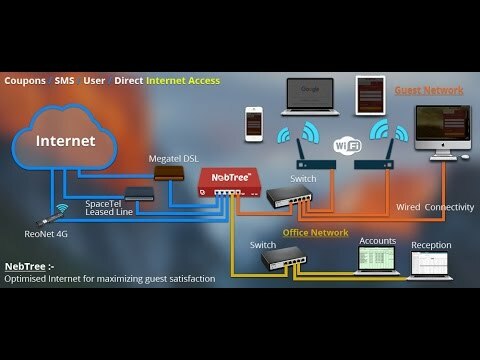 Nebtree is a diversified Internet management system for delivering reliable, controlled, stable Internet access via user management for hotel’s, conferences, malls, restaurants, resorts & other public places. It complies with government norms for delivering Internet access to users like sms based verification or by integrating with user registration system. It uses multiple Internet connection for delivering 100% uptime and sharing Internet load between multiple connections with fail-over solution for optimal use of resources. Q. How guests can send Internet access request? A user is required to fill details on joining wifi for Internet access, here user enters in His phone number and other optional details, a request form information is received as popup on reception desk computer, reception desk person verifies the credentials of the person and with a single click accepts or rejects the request. If request is accepted a sms containing OTP (one time password) is sent to the user. Q. How we can reduce or extend the expiry date of the users in Nebtree? From admin console, by clicking on Clients->Client List-> click on pencil button on extreme right of user. It will allow you to modify the expiry date and time. Q. How to disconnect a live user? From admin console, by clicking on Clients->Client List -> Search with Registration number, name, IP or manualy find find the user in the given list below the search bar. After you find a user Click on pencil button on extreme right of user and change its expiry date and time. Q. How Internet fail-over works in Nebtree? Administrator can define failover for multiple Internet links. If your primary Internet link fails, users shift to second Internet link. If second link fails user get switched to third link. If third fails, users get switched to first Internet link. When connectivity is restored, users are switched to Internet link as defined in their plan. If all links are functional, user is routed via Internet link as defined in Internet plan of user set by administrator. Q. How can Nebtree integrate with PMS(Property Management Software)? Yes Nebtree works with most of the industry standard PMS available in market. It offers a very easy to use API (Application Programing Interface). Integrating Nebtree with your present setup to create, list, expire, modify users and Internet plans is as simple as integrating sms API to your system.